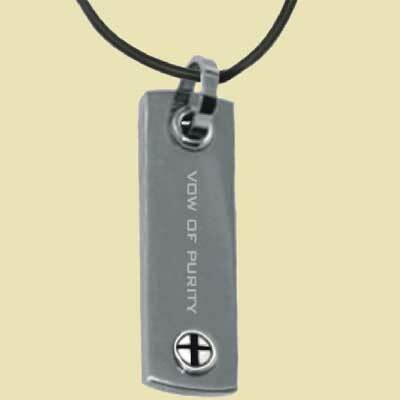 The words VOW OF PURITY are etched vertical on this polished stainless steel tag with a Cross button attached to a black leather choker. Leather cord in 18" long. Acknowledging that God has made me in His Image, made my body to be His Temple, and has graciously saved me and removed me from my sin, it is my desire to please Him. From this day forward, I, ________________, vow before God and witnesses, in obedience to God's Word, to keep myself chaste and pure, to give myself totally and only to the mate that God is preparing for me. 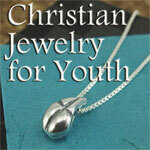 May this pledge I make today, __________________, 20___, honor You, God, and bring glory to Your Son, Jesus Christ. Amen."